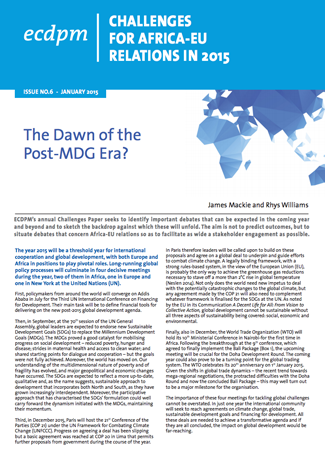 ECDPMThe universal post-2015 agenda – how fit for purpose is the ACP-EU partnership? 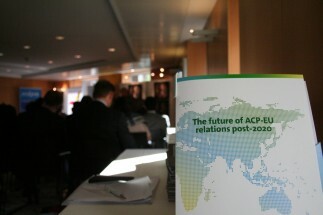 The universal post-2015 agenda – how fit for purpose is the ACP-EU partnership? Universality is one of the key aspects of the global post-2015 agenda, but what does this mean for ACP-EU? Jean Bossuyt and Niels Keijzer explore in this ECDPM blog. This is Commission President Juncker, speaking at the launch of the European Year for Development in Riga, 9 January 2015. For the EU, the new post-2015 global development agenda – expected to replace the present Millennium Development Goals – should clearly be ‘universal’. The possible adoption of a truly universal agenda would have far-reaching implications. It will drastically change the ‘software’ on which the cooperation system has been based for decades. 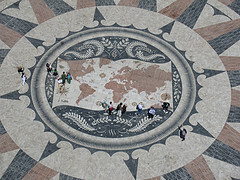 A universal post-2015 agenda is set to abandon the traditional North-South divide as the dominant conceptual frame and rationale for transfers from rich to poor countries. It would apply to the EU as well. The thematic agenda of post-2015 and its ‘sustainable development goals’ (SDGs) broaden the remit of international development cooperation – far beyond poverty reduction and includes many things that were not traditionally financed through Official Development Assistance (ODA). Development cooperation is moving ‘beyond aid’. International solidarity will continue, particularly with the poorest countries or fragile states. Yet the focus will be less on ‘financial transfers’ and much more on: managing global challenges through new forms of collective action, policy coherence for sustainable development (PCSD), global governance and mutual accountability. The principle of ‘differentiation’ will move to the centre stage. The EU already differentiates its financial assistance according to levels of development, including towards African, Caribbean and Pacific (ACP) countries. The notion of ‘shared responsibility’ will be crucial for implementing the post-2015 Agenda. Implementing this new global agenda cannot simply be entrusted to multilateral institutions, aid agencies or partnership frameworks that were created in another era. Innovative global and regional governance structures will be needed. New institutional actors and stakeholders will join the cooperation process (beyond the traditional ‘development community’). The battle is still raging on about how to further the universal post-2015 agenda, and what ‘means of implementation’ this requires. Yet the old model of unilateral (financial) solidarity between North and South is clearly on its way out. Development finance ‘beyond aid’ will be based on domestic resource mobilisation as well as on contributions by all countries (depending on their respective capacities). What does this all mean for the ACP-EU partnership? This is not an easy question for the architects of an ACP-EU partnership beyond 2020. While there are still many uncertainties on the outcome of the post-2015 process, it would make little sense to disconnect the two processes. Inevitably, the new agenda will shake up many of the premises upon which the ACP-EU construct rests. At first sight, the key principles that underpin the Cotonou Agreement –such as ‘contractual relations’, ‘equal partnership’, or ‘joint management’– seem relevant for the type of collective action required by the post-2015 agenda. Yet evidence clearly suggests these principles have not been consistently and effectively applied in the current ACP-EU partnership. So their real value for pushing forward the new agenda remains to be tested. The adoption of a universal agenda seems contradictory to the current ACP-EU framework. Historically, the partnership was an exclusive pact between former European colonial powers and their respective colonies. The initial ambitions of the partnership, in 1975, to change the nature of international relations have gradually been diluted.Instead, the Cotonou Agreement has become the archetype of a North-South partnership, primarily concerned with the implementation of the consecutive European Development Funds (EDF). Beyond this, it is difficult to detect effective collective action (beyond declarations) on ‘non-aid EU policies’, such as dialogue on EU policies that may affect ACP interests, political dialogue on common interests or joint engagement in multilateral governance. Can the ACP-EU partnership embrace the new global agenda (beyond poverty reduction)? At first sight this should pose no problem. 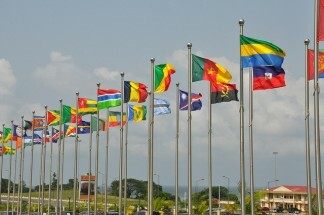 The EU and the ACP already agreed to join forces to build consensus around a strong new agenda. Yet experience suggests that merely adding the new thematic priorities in a possible successor agreement will not be enough to guarantee meaningful collective action.A telling example is the fate reserved to Article 12 of the Cotonou Agreement, which allows for ACP-EU dialogue on EU policy that may affect ACP interests and can be linked to ongoing post-2015 discussions on ‘policy coherence for sustainable development’.So far it has hardly been used by the ACP Group – despite its crucial importance. Furthermore, many of the big issues of the post-2015 agenda, such as climate change, decent work, security, are addressed in other policy fora. 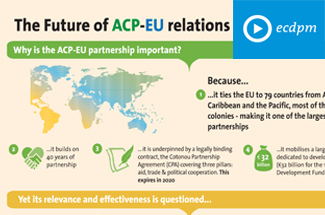 How will a possible future ACP-EU agreement deal with these realities? Can the partnership ensure a comparative advantage over other (competing) multilateral arrangements, continental frameworks e.g. the AU, regional bodies (e.g. CARICOM, Pacific Forum), or more cohesive groupings formed to defend common interests, such as SIDS –Small Island Development States? What type of partnership ‘beyond aid’? If the ACP-EU scheme wants to remain relevant, it will have to demonstrate real added value as a ‘political’ framework that can deliver mutually beneficial deals between states and regions with often competing interests.Can a possible successor agreement deliver this? Under what conditions? How? In the absence of clear answers, the attractiveness of continental and regional schemes, such as the Joint Africa EU Strategy (JAES) and the African Union, the EU-Caribbean strategy or the EU-Pacific strategy, may continue to grow and provide alternative for channeling EU funds. How to address differentiation in the ACP? The ACP Group seems rather reluctant to accept ‘differentiation’, which it perceives as a threat for its unity and solidarity. Yet it will be hard to justify the continuing use of traditional development cooperation in the growing number of Middle Income Countries (MICs) within the ACP as some small island states now have larger GDP per capita than particular EU member states.In resource-endowed ACP countries, the problem is not ‘more aid’ but proper governance and a fair distribution of domestic resources. Europe faces challenges as well. As differentiation is applied, the EU will have to clarify what it can really offer, as a global player, to partner countries that have graduated out of aid. What is the appropriate institutional architecture? The post-2015 agenda requires a critical look at the organizational set-up of the ACP-EU partnership. Rather than simply putting a fresh layer of paint on the walls of the existing edifice, parties may need to assess whether the overall institutional architecture is suitable to implement the new global agenda. Is there enough cohesion on both sides to negotiate around common interests?To what extent and how can the ACP-EU partnership be turned into an effective framework for collective global action? How can a possible future partnership go beyond official parties (or the ‘Brussels bubble’)? To what extent and how can the participation of civil society, the private sector and local authorities be deepened and made more effective than now? How to fund the partnership? How should the global development agenda be funded if the ACP-EU framework is maintained? Solidarity will no longer be one-sided but require contributions from emerging economies and MICs. Furthermore, if the ACP Group wants to be more than a ‘conduit for aid’, become a credible global player and diversify partnerships (beyond the EU) it seems only logical that members contribute the full cost of their structures. It is therefore in the interest of all parties involved to check how compatible the new ‘software’ of the Post-2015 agenda is with the ‘hardware’ of the current ACP-EU framework and what changes may be required to ensure an effective delivery of tomorrow’s cooperation. 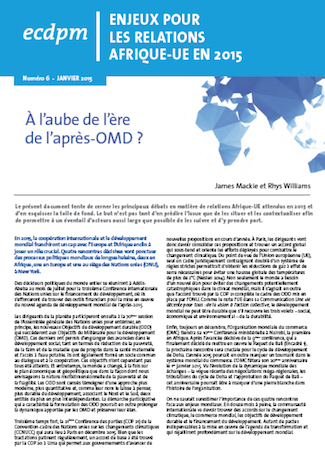 The authors wish to thank ECDPM staff and associates for their contributions to this article. Photo courtesy of Bernt Rostad.